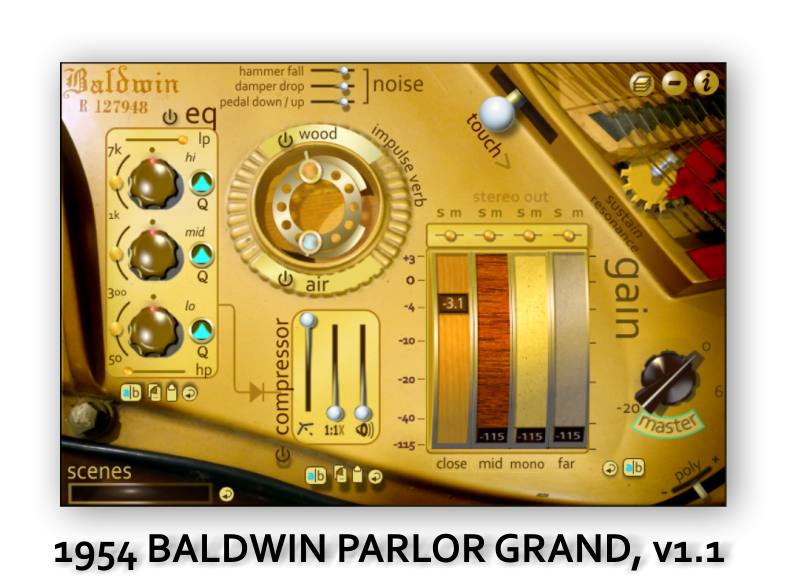 1954 Baldwin Parlor Grand by Whole Sounds, LLC is a Virtual Instrument Audio Plugin and Soundware (e.g. samples or presets that load into other products). It includes, and is therefore "powered by", UVI Workstation, which functions as a VST Plugin, an Audio Units Plugin and an AAX Plugin. Baldwins, from the big grands to the Acrosonic spinets, have always been favorites of ours, especially the beautiful Baldwin that's been in our studio for decades. We're excited at the prospect of sharing our piano with you, and seeing it stand alongside venerable brands like Steinway, Yamaha, and Bösendorfer in your virtual instrument arsenal. At 5'8", the Baldwin "R" series represent a mid-point between a full grand and the smaller baby grands, resulting in an piano with plenty of depth and power, but more intimacy than what's offered by a bigger grand. This instrument is versatile and expressive, packed with features we thought could really express the piano's musical story. It's got a wide dynamic range, with a real bite that's great for rock tracks, and a gentler side, too, that's complemented by the alternate mic positions and audio processing options. Included are eq & compression tailored to work well with the piano's acoustic footprint, convolution reverbs built to emphasize specific sonic characteristics of the piano, key release layers, sustain pedal resonance, and pedal sounds. My philosophy as an audio engineer has been to trust the sound of the instruments I record and present them with as little fuss and bother as possible. As a result, the path between the recording sessions at my studio and sampler playback on your end has been as straight as I could make it. There's no synthesis involved, no stretching or tuning, no enhancements or sweetening. Just the inimitable sound of this particular Baldwin, built in Cincinnati Ohio in 1954, serial #127948. Close vintage Neumann KM84 mics inside the piano. Mid new AEA R88 stereo ribbon mic about 18" from the open lid. Mono new AEA R84 mono ribbon mic. Far vintage AKG C414-B-ULS in an adjacent, open door drum booth. Preamps used were Doug Fearn's VT-2 & VT-12, and Fredenstein mic pres. Lynx audio converters recording at 88.2k, 24-bit. All audio processing performed at 88.2k. Four channel mixer, with pan, mute, solo and master volume. Eq & compression for each channel tailored to the piano's acoustic footprint. Custom-built impulse 'verbs "air" & "wood". 2 separately controllable key release layers, "hammer fall" & "damper drop". Damper pedal sounds respond dynamically. Sustain pedal open string resonance. 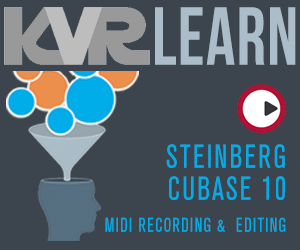 Pedal, key release, and sustain resonance layers can be clicked off for a economy setting. All settings can be easily saved and recalled within the open piano. A/B, copy, paste and reset buttons for quick work flow. Velocity curve control, a.k.a "touch". Stereo & multi out patches. We offer a full-featured demo version of the piano, the only difference being a reminder tone every 15 seconds letting you know you're still running the demo. No iLok registration or purchase required.